Could this be the chasm? We hope not. Ahhh, the start of the real chasm! Steep cliff side with 'Ohi'a trees. A small natural shelter in the cliff. Cracked earth and jumbled boulders. Distant cinder cones loom on the horizon. An interesting piece of lava. More of the fissure and valley. John discovers the first lava tube. Continuing on along the fissure. A shady spot with fine sand dunes. 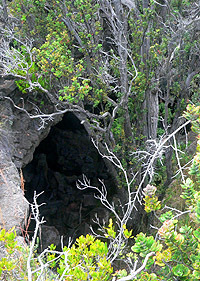 The second giant lava tube entrance. Recently John was reading the book Journal of William Ellis - A Narrative of an 1823 tour through Hawai'i (Mutual Publishing 2004) by, of course, William Ellis. As a missionary, William Ellis traveled many of the Pacific Islands and documented much of his travels. 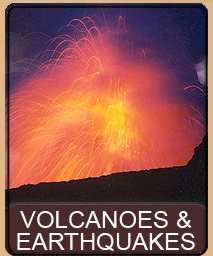 In his book, originally published in 1825, Ellis describes coming to the Big Island and encountering chasms and volcanic activity in Ponahohoa [sic] (note that Ellis called the area Ponahohoa, while today the area is Ponohohoa - we will use both names here). Intrigued by the descriptions of Ellis, we decided to see if we could find the Ponohohoa Chasms on our own. Other than the name, and vague descriptions of where it was located, we set out to what we thought was an approximate location for the chasms. After hiking for about 2 miles through the beautiful Ka'ū desert, we came up totally empty handed. Undaunted, we decided to research it a bit further and discovered, much to our embarrassment, that while little factual information exists - the GPS coordinate locations are listed on about 7 or 8 websites. Equipped with latitude and longitude GPS coordinates from the USGS website, and our trusty GPS unit, we headed out on an exploratory trip to see how close we could get. This trip, we decided, would be just to get the lay of the land. We got within 3/4 of the way to the GPS coordinates, but were turned away by rougher walking than our rubbah slipahs would allow. 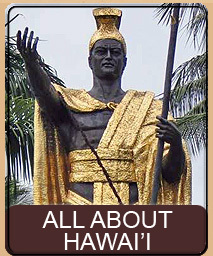 "The site of Ponahohoa is lost today; the location shown on modern maps is a relatively featureless area inconsistent with Ellis' description." 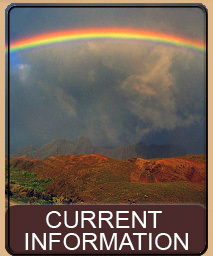 Failure is not a word the InstantHawaii team uses lightly. However--being that this was our 3rd attempt at finding the elusive chasms, and being that even the USGS admits that the site may be lost, perhaps this is a hike that would not be written. But considering we were already out here, we decided to split up and scour the countryside. I headed down, more around the USGS coordinates. John headed up, as only he can, to the top of a very large hill. After walking in spirals for a bit--I joined John, and we continued to explore the ridge. And guess what??! We found the elusive, hidden, and lost Ponohohoa Chasms! Join us on this intriguing, but GPS required hike in the great desert of Ka'ū on the Big Island of Hawai'i, as we attempt to retrace the footsteps of a missionary over 175 years ago. There isn't a trail to the chasms, and our finding them was as much a fluke as anything. However, we completely mapped our course and took a few waypoints so we will present this trail from a GPS point of view. However, if you do not own a GPS, we will say that for the most part -- if you park your car and walk perpendicular away from the highway you will eventually encounter the ridge and chasms. The reason we say this is that when we found the start of the chasms we were to the left of the vehicle (facing the ocean) and when we were done, we were to the right of the vehicle. To find the Ponohohoa Chasms take Highway 11 into the Ka'ū district. 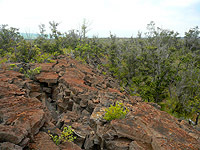 At roughly the 42.5 mile marker, on the makai (ocean) side of the road is a fairly flat expanse of lava with occasional young 'Ohi'a trees.  This is at GPS coordinates N 19.31345 W 155.40965. You will also find a Highway Route 11 sign right here. We turned just after (heading from Volcano) the Route 11 sign. We pulled up onto the lava and drove a short distance so we could park well off the road. We ended up parking at N 19.31319 W 155.40932. You can actually drive quite a ways further, as there is a faint road through here, but more on that later. Prior to taking our third hike, we did more research on what was known about the chasms. Most of the information about the chasms comes from the Ellis book. 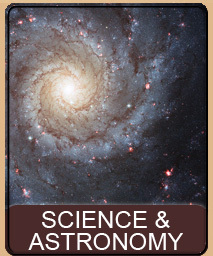 Our book was the most recent republishing of the journal, printed in 2004 by Mutual Publishing in Honolulu (ISBN 1-56647-605-4). 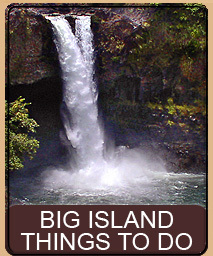 In the paperback edition, on pages 207 through 209, Ellis talks about traveling to Ponahohoa, and finding an old lava field that was smoking and renting. Upon further investigation, Ellis, his companions, and a guide encountered a sunken valley, about a half-mile across and fifty feet deep. He reports that this valley had many fissures and two huge chasms with smoke and fumes issuing from them. Ellis goes on to relate that as they continued to follow the smoking fissures, their guide abandoned them, fearing the anger of the Goddess Pele; however, Ellis continued on. Ellis then talks about walking through the chasm for over a mile while witnessing flowing lava and thick smoke and that in places the chasms was 50 to 60 feet deep. The selection below is a direct quote from the book where Ellis discusses his find. We have reproduced this section with permission from the publisher (Mutual Publishing) and this is quoted from the paper back version of Journal of William Ellis - A Narrative of an 1823 tour through Hawai'i (Mutual Publishing 2004). After breakfast three of our number went to visit the places where we had seen the columns of smoke rising yesterday. 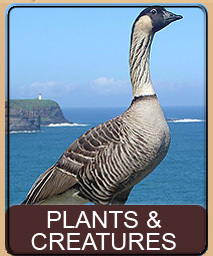 After travelling about five miles, over a country fertile and generally cultivated, we came to Ponahohoa. It was a bed of ancient lava, the surface of which was decomposed; and in many places shrubs and trees had grown to a considerable height. As we approached the places whence the smoke issued, we passed over a number of fissures and deep chasms from two inches to six feet in width. The whole mass of rocks had evidently been rent by some violent convulsion of the earth, at no very distant period; and when we came in sight of the ascending columns of smoke and vapour, we beheld immediately before us a valley, or hollow, about half a mile across, formed by the sinking of the whole surface of ancient lava, to a depth of fifty feet below its original level. Its superficies was intersected by fissures in every direction; and along the centre of the hollow, two large chasms, of irregular form and breadth, were seen stretching from the mountain towards the sea in a south-and-by-west direction, an extending either way as far as the eye could reach. The principal chasm was in some places so narrow that we could step over it, but in others it was ten or twelve feet across. It was from these wider portions that the smoke and vapours arose. As we descended into this valley, the ground sounded hollow; and in several places the lava cracked under our feet. Towards the centre it was so hot that we cold not stand more than a minute in the same place. As we drew near one of the apertures that emitted smoke and vapour, our guide stopped, and tried to dissuade us from proceeding any further, assuring us he durst not venture nearer for fear of Pele, the deity of the volcanoes. 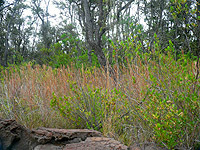 We told him there was no Pele of which he need be afraid; but that if he did not wish to accompany us, he might go back to the bushes at the edge of the valley, and await our return. He immediately retraced his steps, and we proceeded on, passing as near some of the smoking fissures, as the head and sulphureous vapour rising from them would admit. We looked down into several but it was only in three or four that we could see any bottom. The depth of these appeared to be about fifty or sixty feet, and the bottoms were composed of loose fragments of rocks and large stones, that had fallen in from the top or sides of the chasm. Most of them appeared to be red-hot; and we thought we saw flames in one, but the smoke was generally so dense, and the heat so great, that we could not look long, nor see very distinctly the bottom of any of them. Our legs, hands, and faces, were nearly scorched by the heat. Into one of the fissures we put our thermometer, which had stood at 85° it instantly rose to 118°, and, probably, would have risen much higher, could we have held it longer there. 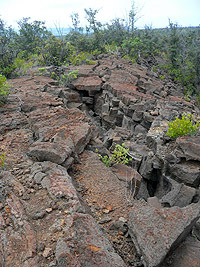 After walking along the middle of the hollow for nearly a mile, we came to a place where the chasm was about three feet across, at its upper edge, though apparently much wider below, and about forty feet in length; and from which a large quantity of lava had recently vomited. It had been thrown in detached semifluid pieces to a considerable distance in every direction, and from both sides of the opening had flowed down in a number of smaller streams. Examining maps of Ka'ū you can find that the Ponohohoa Chasms are indeed marked. It appears there are a number of chasms dotted in a rough line within about a mile of the highway and a couple of miles away from The Great Crack. So armed with the Ellis description and what we thought were valid USGS GPS coordinates, we set out to find the chasms. An Important Note About GPS Coordinates: All GPS units have an inherent inaccuracy that is based on how many satellites it sees, at what angle they are, the weather, and obstacles that may block the view. All GPS coordinates are approximate and you should rely on your eyes to look for dangers, and not trust the coordinates to be a safe place. Our GPS recorded an accuracy drift of 20 to 60 feet throughout this hike (we are using a Garmin eTrex Vista C). 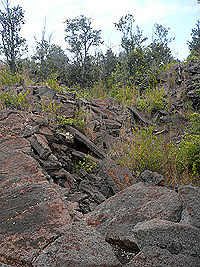 This walk is not within Hawai'i Volcanoes Park Land. We are unsure as to the ownership of this barren area, but please respect the land and anyone you encounter. There are no fences, gates, signs or postings that we could find anywhere on this walk. In fact, for most of this walk we saw no indication of humans. Always be careful to look where you are walking. 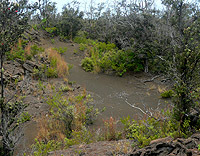 Much of this hike is over barren lava, but parts also go through forest. When walking through forest, be cautions of hidden holes and rocks. When at the chasm pay close attention to the edge of the cliffs and avoid unstable rocks. 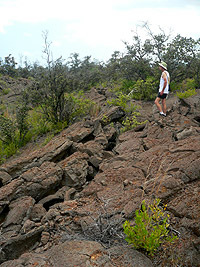 The beginning of the walk is over fairly flat lava. The entire hike is fairly easy, but this first part is by far the easiest. The initial GPS coordinate that we found on the USGS and other websites is N 19.31028 W 155.40222 so we began by hiking to those coordinates. After a distance, the lava gets a bit more hilly and then gives way to a thick, long grass and 'Ohi'a forest. We did our best to skirt around the forest, but to reach the USGS coordinates we had to finally go through the forest and out to a relatively flat area. Reaching the USGS coordinates, we found them to be just on the other side of the forested area, in a relatively barren and somewhat sunken area. While there were a few small fissures and a hole here or there, there was nothing you could possibly have fit a human into, much less call a chasm. Since our position could be off as much as 60 feet, we scouted the area. However there were no significant features. John instinctively headed for a large ridge to get a better view of the land and I eventually joined him. We walked to the top of the ridge and a bit down on the other side. Following it down, after a bit we suddenly reached a large valley, perhaps 60 or 70 feet across and 30 to 40 feet deep. Could this be the start of the chasms? Looking to our left, the valley continued -- though it became narrower and was cluttered with fallen boulders. To our right, the split was larger and seemed to extend pretty far. We marked this position as N 19.30944 W 155.39992. Descending down into the valley and up the other side we discovered a large featureless plane that extended to distant cones near the ocean. Our valley looked to be the most promising discovery so far. We crossed back over and continued walking the edge. The valley began to resemble a large fissure more than a natural valley. Large cracks in the earth were all around us, with loose boulders in the cliff side and fallen boulders and the base. 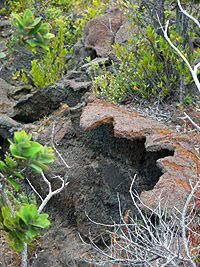 However, nowhere did we see evidence that this area had fresh lava that came out of the fissures. Instead, this was a fairly old and weathered flow and the valley looked to be caused by subsidence and earthquake damage. Continuing on along the cracked edge the fissure narrowed and then widened, similar to how Ellis described it. However, some of what we had read hinted that people might have, at one time taken shelter in these chasms, so we were on the lookout for a cave or sheltered area. After a bit, John, who is usually a bit ahead of me, said, "come look at this". In front of us was a huge opening in the ground. A massive lava tube obviously went through here. We scrambled around the hole to see the direction the tube went. The tube was large enough to drive a truck through and extended along the base of the fissure. The opening itself was easily 50 to 60 feet across and the tube extended in at least two directions, perhaps three. 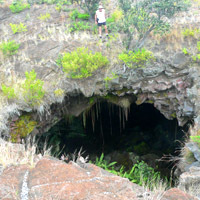 John gingerly looks down into a huge lava tube. Well here was something that could certainly give shelter. And by all appearances the tube was probably pretty long and large enough that it was probably walk-able. It is highly possible that this tube went along the chasm from one end to the other and there were perhaps other entrances and exits that could be found. Suddenly, as John approached the opening, a huge owl flew out of the cave. I quickly pivoted my camera and reeled off two fast photos and yelled, "I got it" and then... noted that my lens cap was on (see photo to right of Owl flying from cave with lens cap on - no really, it's a picture of an owl). 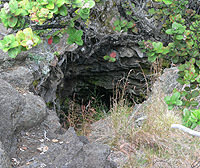 This is somewhat interesting because this is the second time we have found owls living in lava tubes in Ka'ū, the other being The Great Crack further down the road (and no, we didn't get pictures of that either). Our GPS unit recorded the position of the huge lava tube and cave as N 19.30890 W 155.40051. This would certainly be a spelunkers dream, and we don't see any evidence of these tubes having been explored or mapped. 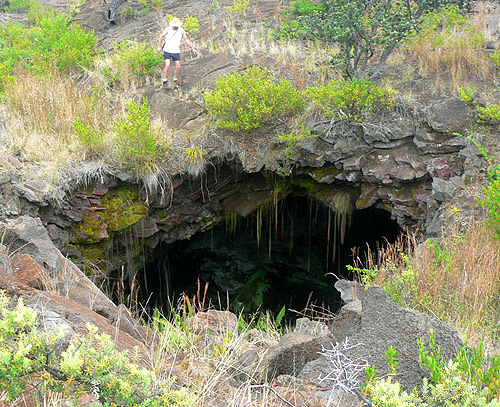 In fact, at no time during our hike around the chasm and the lava tube did we encounter any evidence of humans. No trash, no footprints, no broken branches or piled rocks: pretty much no indication that anyone else had recently been in this area. Continuing on our way, the fissure ambled in a southern direction and we kept skirting the rim. Suddenly we neared an apparent end to the fissure. At the end, the fissure was about 40 to 50 feet deep. 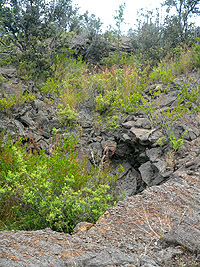 At the very bottom, in the side of the cliff was another huge cave entrance and lava tube. Even though this tube is difficult to photograph, it looked to be larger then the previous one, apparently splitting off in several directions as it went under the cliff. If we had proper pants, flashlights, and a sturdy rope, it would have been possible to get down into the valley and enter the tube from the opposite end of the fissure. We marked the position of this feature as N 19.30544 W 155.40268. 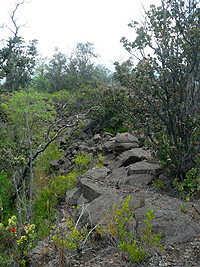 We attempted to go a bit past this final area, but as far as we could tell, other than small cracks, jumbled rocks, and lots of 'Ohi'a trees, the fissure was closed. 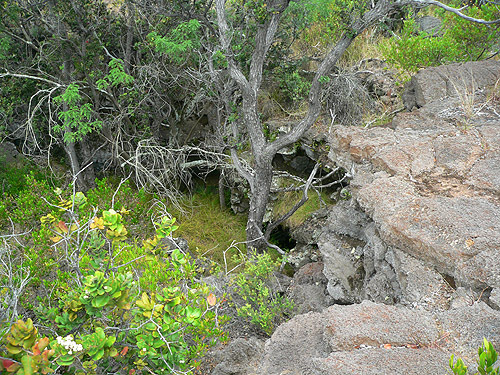 Most likely there are more lava tubes and fissures as the maps all indicated a series of them, but we were, for the most part, elated at what we had already found. At this point we started to head back to our vehicle. While angling toward the right, where our vehicle was parked, we actually also went to the left to skirt a thickly forested area. Stepping through some brush we were startled to find that we were on a crude road that went right over the bare lava rock. What? We wondered... did we miss an obvious road straight out to the chasms? Did we needless scramble through brush and briar only to discover that tour buses regularly drive this route? We examined the road. While it certainly kept going, it was already past what we considered the end of the fissure and was meandering somewhat parallel to the highway and fissure. In the opposite direction the road appeared to go towards our vehicle, so we decided to follow the road and see where it leads. At this point we were at N 19.30684 W 155.40578. The road is rather hard to follow as it becomes nearly invisible in spots where it goes over naked lava rock, but we were able to pretty much follow the road till we got near our vehicle. Near the vehicle the road went more to the right, but obviously came out somewhere on the highway nearby. Our conclusion was that while interesting, the crude road was probably for pig and goat hunters and that it most likely did not lead to any significant part of the chasms, though this is certainly something we might double check by driving it some day. Did we find the Lost Chasms of Ponohohoa? We are not quite certain. Our discovery has some similarities with the Ellis narrative - especially his initial discovery. However, the later statements by Ellis state that they followed a crack more than a mile and that they encountered glowing rocks and also all the locations reported having steam and fumes. Our examination of the chasms indicate that no lava flowed from them or the fissures. But still they bear an eerie resemblance to the initial description by Ellis. 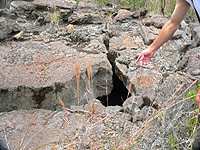 Our suspicion is that Ellis might have very well been describing the feature we found - but then later, while continuing past where we stopped, he encountered The Great Crack, which is an 8 mile fissure, 60 feet deep in places, that shows quite a few signs of lava having flowed out of it. 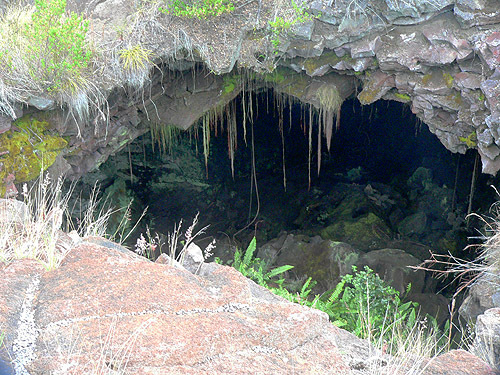 The fact that there was steam in all the places suggests that the huge lava tubes we saw might have been connected to the tubes flowing in and around The Great Crack and may have vented fumes from the flow in the Crack. Indeed, even the USGS website hints at the possibility of Ellis confusing The Great Crack for the chasms - which is why they go on to speculate that the chasms are lost or simply mislabeled. 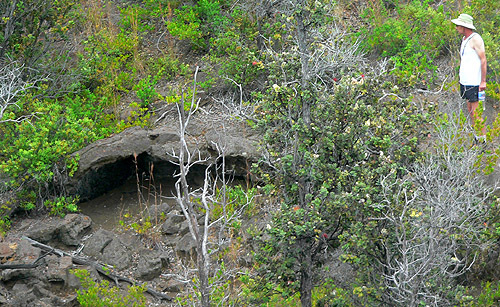 We, however, are unsure given the huge feature and lava tubes we discovered as we retraced the footprints of an early explorer of Hawai'i. We certainly found something, and we suspect Ellis did too. 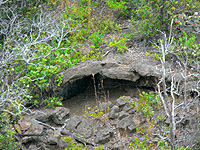 A closeup of the first, huge lava tube. Very difficult to see second huge lava tube is about 50 feet down. 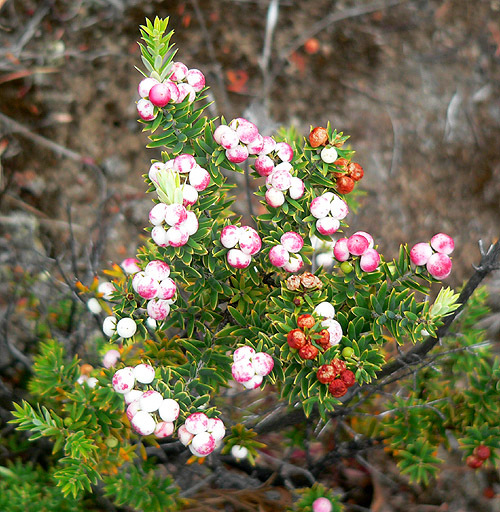 A beautiful Pūkiawe plant grows from the lava. This page is named 'Hikes.ponohohoa'. Can't Find It?